Kairat Abdrakhmanov is the Minister for Foreign Affairs of the Republic of Kazakhstan. He has previously served as Kazakhstan’s permanent representative to the United Nations. He also served as Kazakhstan’s representative to the Organisation for Security and Cooperation in Europe (OSCE). This article was previously been published by The Diplomat. The cutting-edge science on display has been both intriguing and delighting to the many thousands of visitors in the exhibition’s first few days. More than 15 national leaders, including the presidents of China and Russia, prime ministers of India and Pakistan, and the king of Spain as well as heads of many neighboring countries and the UN secretary general attended the opening ceremony. The presence of these world leaders underlined the global importance of the event. We look forward to welcoming visitors from other regions of Kazakhstan, as well as from abroad. We are delighted that all the hard work that went into getting the site – and facilities in the city – ready has been so appreciated. We are proud as well that the exhibition has attracted so many major players in the field of energy to share their latest scientific thinking and advances. Staging such a major international event, of course, requires not just detailed planning but also resources. So it is understandable why there have been some questions, particularly from those who do not know Kazakhstan well, about why our country was so keen to take on this responsibility. And this has sometimes been coupled with puzzlement as to why a nation with huge oil and gas reserves decided that future energy should be the theme for the exhibition. The answers to these questions are, of course, obvious to anyone who has been following our country’s progress over the last 25 years. From our earliest days as a modern, independent nation, we have promoted international cooperation as the only answer to global challenges. We have also been determined to draw on ideas and expertise from across the world to help us modernise our economy. Against this background, staging an international event which encourages countries to share knowledge and technology to address directly one of the most pressing global challenges fits in perfectly with our values and ambitions. Hosting this prestigious event, which symbolises international cooperation and technological advances, for the first time in Central Asia is a milestone not just for our country but the entire region. The fair’s emphasis on the theme of “Future Energy” should be considered in line with the United Nations’ aspirations to attain Sustainable Development Goals. Renewable energy is at the heart of the solution to the challenge of promoting growth, creating jobs, and increasing living standards while protecting our planet for future generations. It is a challenge which we are determined to meet head-on in Kazakhstan. While it is true we have been blessed with abundant oil and gas, we also committed to reducing our reliance on fossil fuels. President Nazarbayev has set our country a goal of meeting half of our domestic power needs from renewable resources by 2050. It is an ambitious target but one which underlines our determination to build a world-class economy. It also recognises the extraordinary potential we have as a country to harness renewable resources including wind and solar power. Staging such an important exhibition in Kazakhstan will accelerate our transition to a modern and sustainable economy. We see it as a powerful driver to achieve our ambition of joining the world’s 30 most developed countries by 2050. But we also believe the engineering and scientific developments on show at EXPO 2017 will have a similar positive outcome on the switch to green economies around the world. We all share this planet and it is vital that global economic growth does not take place at the expense of our environment and future generations. We believe strongly in Kazakhstan that we must all prosper together. Our intention is to support least developed countries, least developed landlocked countries, and small island developing states. There are, of course, always costs to staging such a major international exhibition. But from the beginning, the site was developed to provide a practical and positive legacy for the country. When EXPO 2017 finally closes its doors in September, the buildings and infrastructure will be quickly turned over to new uses to drive the modernization of the economy. The concrete and lasting benefits these will bring will far outweigh any costs. National pavilions will be converted to scientific laboratories for the development and adoption of new technologies. The site will also host an International Center for Green Technology and Investments as well as being home for the Astana International Finance Center. This is a hugely important initiative which will not only attract capital to develop Kazakhstan but all of Central Asia. Apart from the exhibition sites, Astana has acquired enhanced urban infrastructure, including new high-tech airport terminal, the region’s largest railway station, and an upgraded public transportation system. The EXPO produced a big boom in housing, office, and hotel construction in the Kazakh capital. EXPO 2017 will also provide a major boost to our country’s tourist industry. Indeed, as Kazakhstan has already found itself regularly listed high in the must-visit destinations for 2017, there are clear signs this is already happening. Our country has breath-taking natural scenery, a fascinating culture and history, and, as visitors to Astana are already finding, very welcoming citizens. 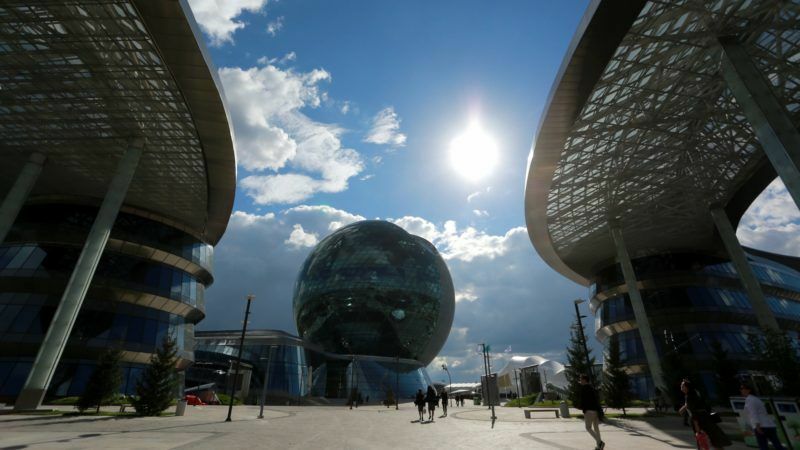 Kazakhstan, thanks in part to the high profile EXPO 2017 is bringing, is about to take off as a tourist destination. This is an important year for our country. Our commitment to peace and dialogue has seen us become the first country from Central Asia to sit on the United Nations Security Council. It is both an honor and a big responsibility. But by hosting EXPO 2017, we have demonstrated our nation’s determination to continue improving living standards for our citizens – and to play our full role in building a peaceful, prosperous, and sustainable world for all.